Scite is a Scintilla based text processing program that is compatible with syntax highlighting. It does not need any installation. Since this is a portable application, you can save it wherever on your hard drive and run it. You can also place Scite to a USB flash drive or similar storage unit, in order to use it on any computer with minimum effort. What's more, the Microsoft Windows Registry does not collect new entries, and leftover files are not kept on the hard drive after removing the program. 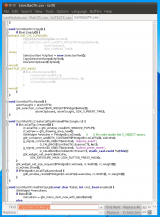 Scintilla contains features especially effective when editing and debugging the source code. These include support for error indicators, syntax styling, code completion and call tips. The selection margin can include markers like those used in debuggers to display breakpoints and the actual line. Styling options are more open than with many editors, enabling the use of proportional fonts, italics and bold, numerous foreground and background colors and numerous fonts. SciTE is a SCIntilla based Text Editor. Originally developed to show Scintilla, it has grown to be a mainly effective editor with abilities for developing and running programs. It is best used for jobs with simple configurations. The documentation is not very good. SciTE has been tested by Download82.com team against viruses, spyware, adware, trojan, backdoors and was found to be 100% clean. Our editors will recheck this software periodically to assure that it remains clean.